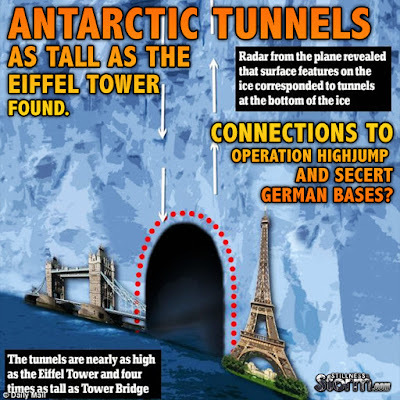 Antarctic Tunnels as Tall as the Eiffel Tower Found | Connections to Operation Highjump and Secret German Bases? Here is an interesting article discussing the discovery in Antarctica of huge tunnels, as large as the Eiffel Tower, 324 meters (1,063 ft) tall. There are several accounts that discuss ancient cities, and even nazi bases being built in Antarctica. Operation Highjump is one such military operation that attempted to deal with secret Nazi bases in Antarctica during the 1950's, headed by Admiral Byrd. Corey Goode, a secret space program insider, and whistleblower testified that there are ancient city networks under the ice of Antarctica, which he discussed in his show Cosmic Disclosure. This recent find by scientists confirms part of what he disclosed. Possibly there is much more hidden beneath the ice that mainstream academia has been unwilling to consider. The author of the article below does not contend that German bases were possible, citing lack of technological development needed to produce them. But with the disclosures of Goode, wherein it is said that the Germans were working with highly advanced groups that helped propel their already well established secret space program to new levels of advancement, it stands to reason that they could have settled on the icy continent with ease. Possibly more evidence will be revealed as time goes on. I absolutely had to blog about this one, since so many people sent me versions of this story, and because I've written about Antarctica in conjunction with the persistent postwar rumors of some sort of Nazi base there, and because of the persistent rumors of "high strangeness" on the southern polar continent. Researchers from a number of UK universities and the British Antarctic Survey - a research centre based on the continent - detected the tunnels when they flew a plane over the Filchner-Ronne Ice Shelf in West Antarctica. The 820-foot tunnels are nearly as tall as the Eiffel Tower - which measures just over 987 feet - and more than four times as tall as Tower (Bridge) - which comes in at 213 feet. Researchers concluded that the placement of the tunnels means that they were most likely formed from meltwater - water released from melting ice - that flowing underneath the ice sheet, over land, and into the ocean. This intrigues me for the obvious reason that it appears to confirm in some respects those persistent stories about Nazi bases in Antarctica that have been around since the Nazi Neuschwabenland expedition to the continent in late 1938 and early 1939, that I review in my books Reich of the Black Sun, and again in Roswell and the Reich. These rumors have always included the idea, in some circles, that the Nazis actually built and maintained research facilities on the continent for the development of advanced and exotic technologies, a view which I have disputed and continue to dispute, simply because such a possibility would seem to be beyond the logistical capabilities of the German navy during the war, and more importantly, when more secure, less logistically vulnerable possibilities existed for the placement of such facilities in southern Latin America. But the presence of such tunnels, of such a large scale, hollowed out but under-ice flows of water, suggest the possibility, one which I have entertained as a distinct possibility, of hidden u-boat bases under the ice. Such possibilities would have been within the capabilities of the German navy, and such bases would have been of value for a variety of reasons. So let's indulge in our trademark high octane speculation once again. Why would one look for such tunnels in the first place, and why would it be the British doing it? the geological and scientific reasons are fairly obvious and do not need to be rehearsed. It's the hidden possibilities, the historical ones, that intrigue me. Tunnels of such size could hide any number of things, large things, and thus perhaps one is looking at yet another attempt to corroborate the existence of lost secret Nazi bases, or even something more ancient. The discovery of the tunnels(or perhaps, re-discovery) places the famous expedition of Admiral Byrd, Operation Highjump, in late 1946 and early 1947, once again into a unique light, for let it be recalled that this expedition was outfitted for a stay of several months, and yet, only stayed for a few weeks, when the Admiral called it quits, and headed back to the USA, giving an interview with the El Mercurio newspaper of Santiago, Chile, on the way back, in which he warned that the USA would have to prepare defenses against "enemy fighters that can fly from pole to pole with tremendous speed."